The Pilot Myu 701 was introduced in 1971 and discontinued by the end of the decade. It originally retailed just a mere 3500 yen. What sets the Pilot Myu 701 apart from most fountain pens is the integrated nib. The design makes the pen looks really sleek and modern. This pen has since become one of the most sought after Japanese fountain pen in the second hand market. The Pilot Myu 701 came onto my radar when I saw Mike Dudek of The Clicky Post posted some photos of it on his Instragram feed. It was love at first sight. The Pilot Myu 701 looks really distinctive and I had to get my hands on it. After a good few months trawling through various websites, I finally got myself a used Pilot Myu 701 F nib at a reasonable price. 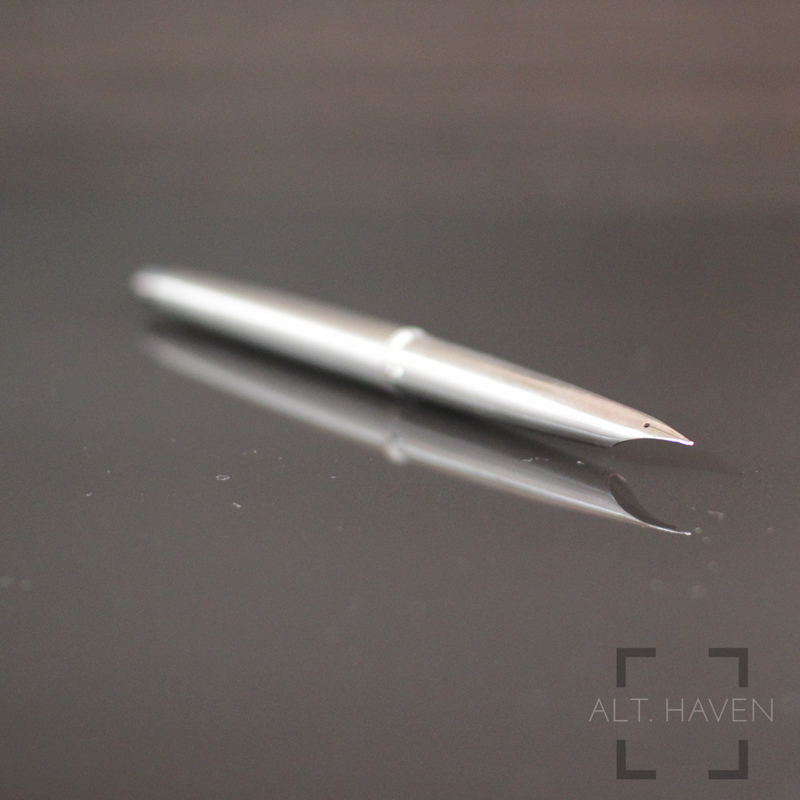 The Pilot Myu 701 is a metal pocket fountain pen. When it is capped, it is small enough to slip into my jeans’ pocket easily. 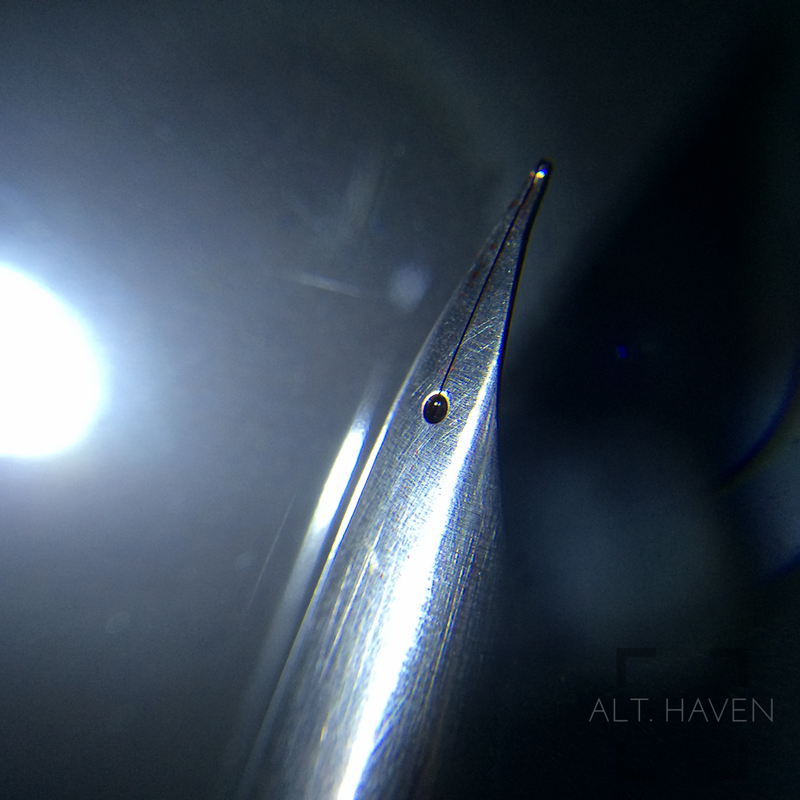 The body of the Pilot Myu 701 is bullet shaped with the clip affixed at the top. The clip acts as a roll stopper as well as a clip. 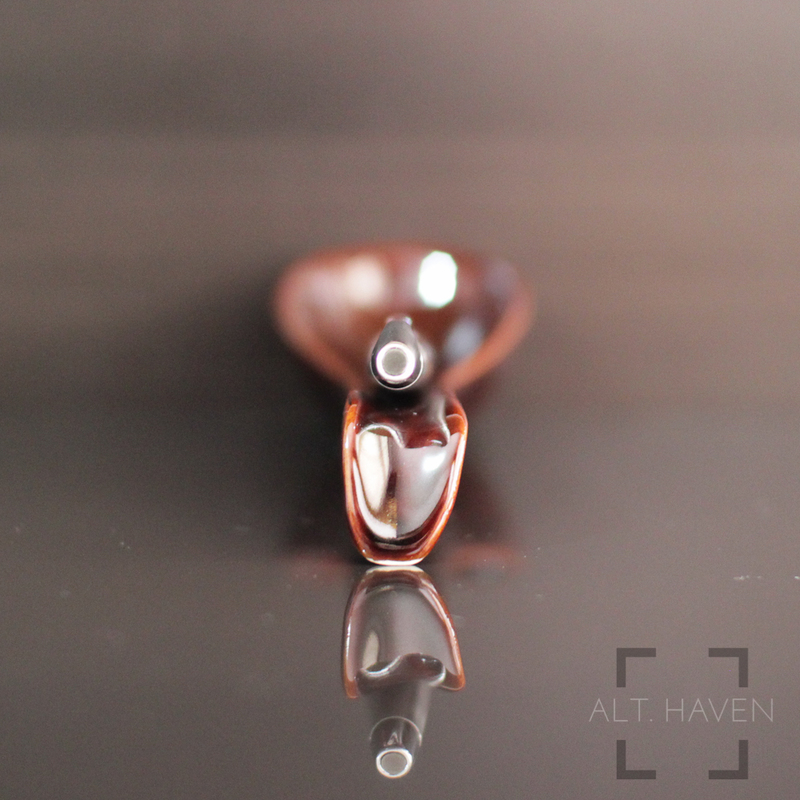 The clip is a simple sheath design with a flat black finial. The clip isn’t too tight till it is too hard to clip onto my pen holder. The cap pops open easily. Though it doesn’t open or close with a audible click, I can feel a subtle resistant when the cap disengaged from the barrel. 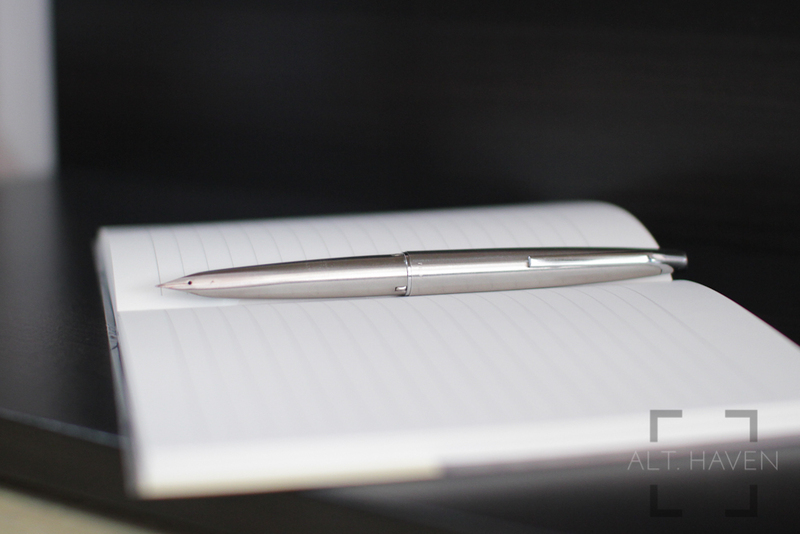 The Pilot Myu 701 uncapped is only a short pen, it is meant to be used with the cap posted. It morphs into a full length fountain pen once that’s done. The barrel, grip section and the nib is one continuous length of metal. It is unadorned with any embellishment or decorations. It doesn’t need any of that. It is unpretentiously a fountain pen. It doesn’t hide its function. The minimalistic look appeals to me. The barrel comes apart easily by unscrewing the middle. The Pilot Myu 701 takes a CON 50 and CON 20 converter as well as the regular Pilot cartridges. Now it comes to the part where I criticise this iconic pen. The grip section is one smooth portion that flows into the barrel without any distinction between the two parts. Yes, it looks very nice, very sleek but it is also super smooth and slippery. It doesn’t take a person with sweaty palms to have trouble. When I write with the Pilot Myu 701, I had to adjust my grip continuously. Maybe I am overly cautious with the pen but I don’t have the sense of certainty that the pen is in my hand not going anywhere. If there is anything I wish they had fixed about this pen is the grip section. The nib is just stunning on this pen. The Pilot Myu 701 comes only in fine and medium sizes. I got mine in a fine nib. It writes smoothly and with just the right amount of wetness. It allows for some shading and yet keeps the ink just dry enough to prevent me from smudging all over. If Apple is to make a fountain pen, I imagine it will look much like a Pilot Myu 701. The pen is such an iconic design. Pilot recognised this and had relaunched a Pilot M90 in the style of the original Myu 701. That was limited to just a run of just 9000 pens. 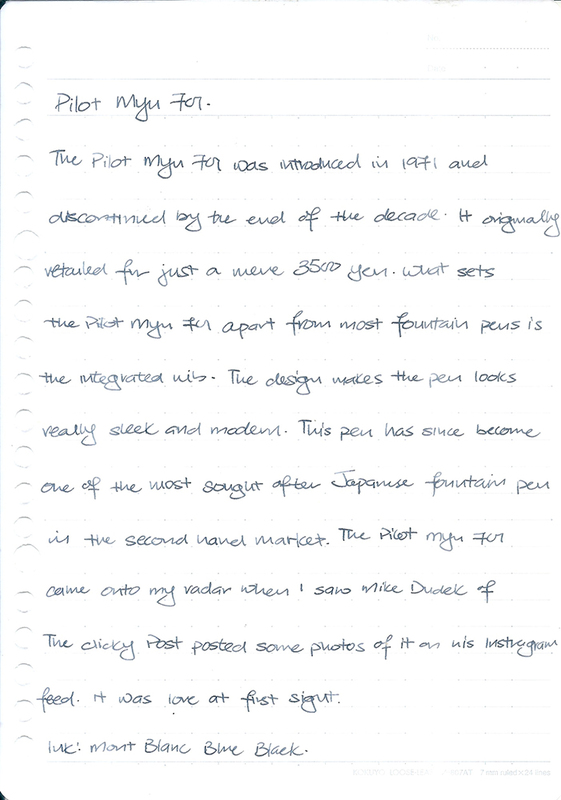 The Pilot Myu 701 was manufactured in greater numbers but it is still hard to find one of a reasonable price. Take your time to search, you will find one that fits your budget.